E-Fund was founded with the goal to achieve consistently higher returns and more exits from angel investments. By investing via teams, we are able to do more due diligence, leverage the industry expertise of our investors and provide post investment advice to the companies we invested in. As an E-Fund investor you invest in our portfolio of current and new angel investments. E-Fund investors are encouraged and incentivized to participate in teams to do due diligence on potential investments, as well as post-investment mentoring and coaching. Those who participate receive performance-based compensation from exits in addition to their return as a shareholder in the fund. Early stage investments can provide excellent returns, but angel investing requires a different approach than traditional investing. Joining an angel investment group is a great way to get familiar with the unique opportunities, risks and rewards of angel investing. 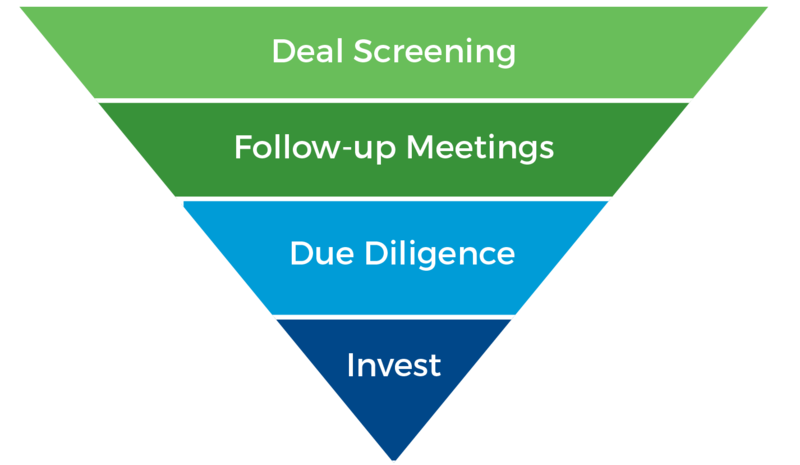 Our team of investors follows a multi-stage process to identify and screen the most promising BC-based companies that meet E-Fund’s investment criteria. Our investment team actively scouts for the best investment opportunities wherever entrepreneurs pitch. We have follow-up meetings with the most promising teams and do due diligence in the ventures that are the best fit for E-Fund. E-Fund capitalizes on a relatively unserved market in de-risked, product ready opportunities found in the gap between early stage investments through friends, family and close contacts and private equity venture capital investments. We invest in ventures that have validated product market fit, a scalable and profitable business model, a strong team that can execute and adapt, proof of traction and a route to an attractive exit. We invest later than some angels, which reduces risk and shortens the time to an exit. That, in turn, results in a higher velocity of capital invested. By investing in E-Fund, you invest in fund cohorts that are continuously diversified with new and follow-on investments. This is a great way to instantly diversify your portfolio across industries, markets, business models, and stages of maturity. Investing in cohorts also delivers a better spread of exits over time. We follow several key principles to deliver better angel investment returns. Active Deal Screening. Many of our investors are actively involved in the start-up community. We see and screen a large number of investment opportunities. Thorough Due-diligence. Our team based approach makes it easier to commit the time required and leverages the deep industry expertise of our team members. Active Post-investment Participation. The best way to protect an investment is to help it succeed. Our team can provide strategic introductions, operational advice, anticipate additional funding needs, and provide operational advice and ongoing mentoring. Diversified Portfolio. Instantly diversify your portfolio across industries, markets, business models, and stages of maturity. We invest in Life Sciences, ICT and Cleantech. As you continue to annually investment with E-Fund you will continue to invest in new companies via different fund cohorts. Proven Processes, Tools and Training. We have developed a unique process and strategy to select the best investment opportunities that leverages our joint domain expertise. Our tools and training support our investors in their due diligence and post investment management work. Deep Investor Domain Expertise. Our team of 70+ investors has deep industry expertise in a wide range of industries. For more information, see Pillars of Angel Investing and research findings from Wiltbank and Boeker. E-Fund is a Venture Capital Corp (VCC) and only invests in EBC eligible companies. *Investors in E-Fund must be accredited investors and residents of BC to qualify for the 30% VCC/EBC Tax Credit. Contact us to meet and talk about angel investing and E-Fund over a coffee. Join one of our upcoming events and meet our board, investors, and meet some of the successful CEO’s of the companies we invested in. “E-Fund offers an opportunity for me to help young entrepreneurs grow and develop new businesses. I get to invest in these projects while helping them along their journey.” – Phil Mundy, CEO and Owner of multiple medical supply companies.